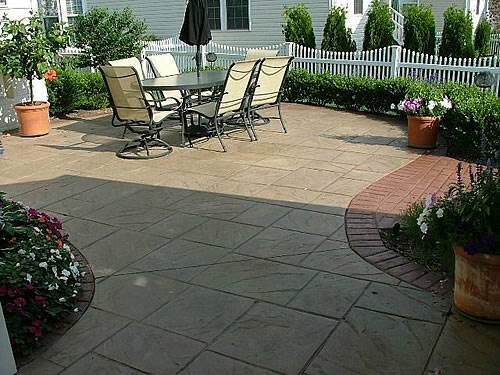 E&R not only has extensive knowledge in Home Remodeling/Roofing we	also have extended our services for Patios, Pavers and Stamped Concrete. We are now combining some of these new finishes to create more realistic	work. 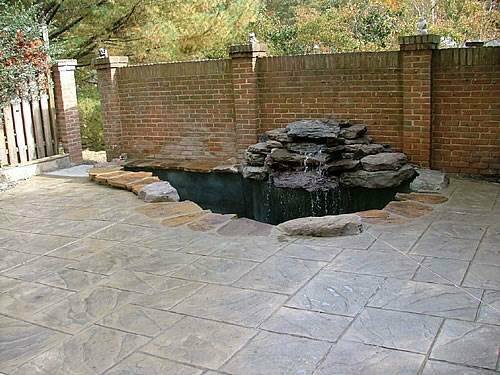 By pairing stamped concrete with water color and patina staining,	we are able to provide multi-colored surfaces with different colored stones	or brick. We introduced diamond finishing of concrete which creates a	terrazzo effect, or when combined with stains or new overlays, creates	a marble look. Our experienced design consultants are ready to come out to your property	and give you an estimate free of charge. Their presentation includes a	portfolio of previous completed jobs, the installation process, as well	as assisting you with design ideas. 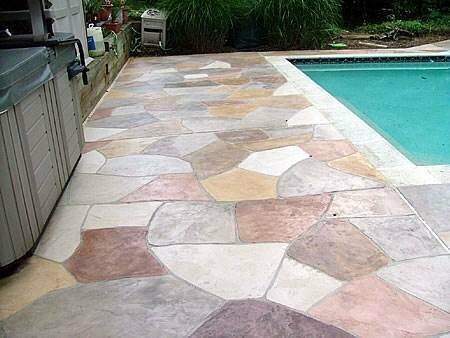 This beautiful pool deck was brought back to life with a decorative concrete	overlay. The Decorative Overlays System is excellent for resurfacing virtually	any masonry or concrete surface. Decorative Overlays are created with	a high strength polymer modified grout mix designed for replicating stone	textures over existing concrete or masonry surfaces. 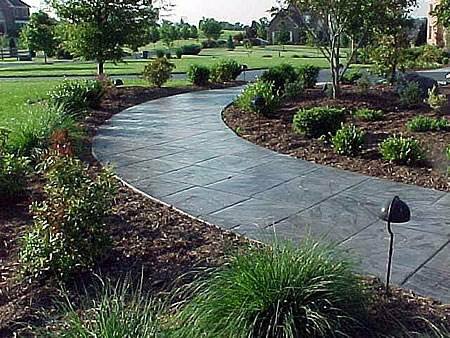 Decorative Concrete	Overlays are chemically designed to address the many challenges of replicating	natural stone textures. 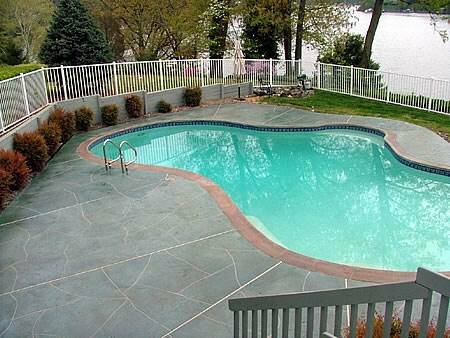 This existing concrete pool deck was structurally sound with surface cracks,	the overlay was install right over the original 25+ year old concrete	slab. The overlay systems allow homeowners to use existing defects in	the slab as part of the design. The pattern is an irregular stone with	4 colors tones, it is made to resemble natural flagstone. Stamp concrete front walkway in Darnestown, MD. 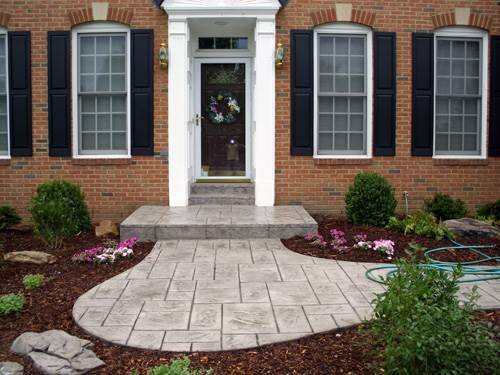 The stamp concrete pattern is a large geometric flagstone design with in	a gray color with a rustic color accent to add another dimension. Stamp concrete front walkway in Clarksburg/Damascus area for a single family home. The stamp walkway increased the curb appeal for this beautiful home, the	ashlar slate pattern is a great compliment to this traditional style house. 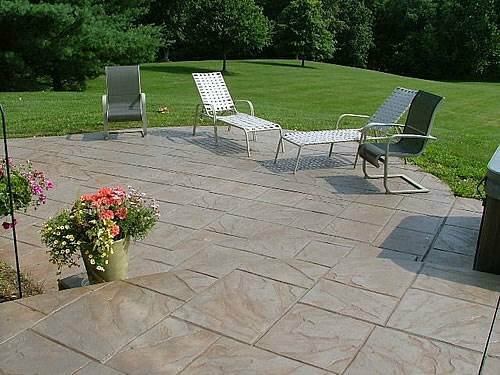 This one of a kind stamp concrete patio displays a flagstone pattern in	a gray color. The patio is a 2 tiered with an upper and lower area to	work allow the homeowner to entertain large social events. Stamp Concrete Patio with red brick borders in Bethesda, MD. This is one of my favorite projects, this stunning patio displays an original	organic design. The design was to allow a more natural visual while also	provide garden beds. This hidden gem of a patio was custom designed as a private oasis in the	city. 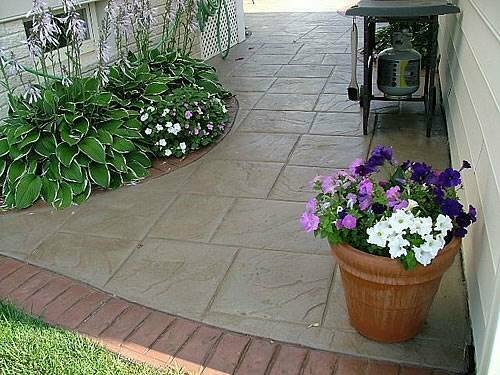 The stamp patio is a Flagstone pattern in a tan color to contrast	with the surrounding red brick. The water feature & koi pond was design/install	to bring tranquil retreat in the city.